Fuller Lake is located above Ice Lake in the San Juan National Forest near Silverton, Colorado. The trail begins near Ice Lake at an elevation around 12,200 feet and climbs to a cirque some 400 feet higher where Fuller Lake sits below a ridge where the peaks tower almost up to 14,000. 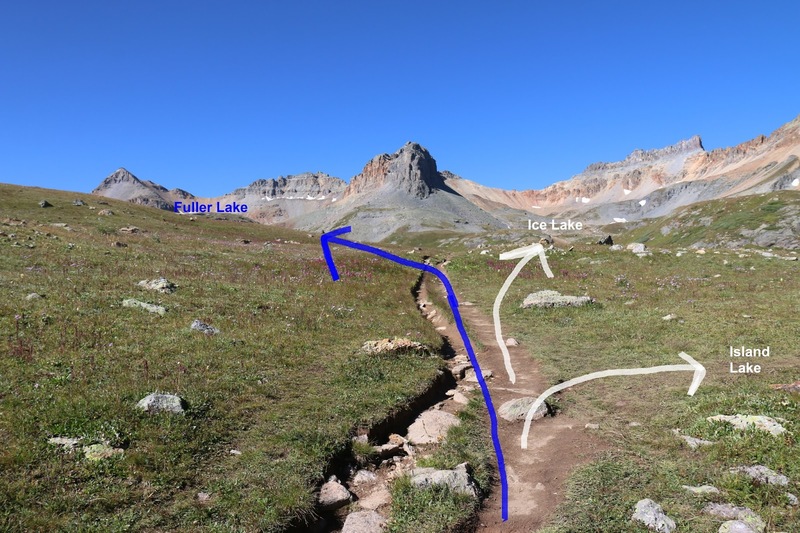 The trail to Fuller Lake is normally hiked in combination with Ice Lake and Island Lake. Since hiking to Ice Lake and then adding Fuller Lake and Island Lake requires at least 10.5 miles of hiking many visitors to the area choose to backpack in at least as far as Lower Ice Lake and then spend a day or two exploring the higher lakes. As the Ice Lake trail enters the Upper Ice Lake Basin the main route continues left past Ice Lake enroute to Fuller Lake. Another trail branches off on the right where it crosses the stream flowing out of Ice Lake and climbs around the mountainside to Island Lake. 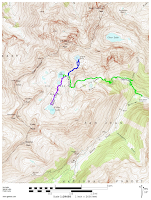 At present there aren't any trail signs that point out the various routes to the three different lakes so bringing along a map like the one at the end of this post can be helpful. 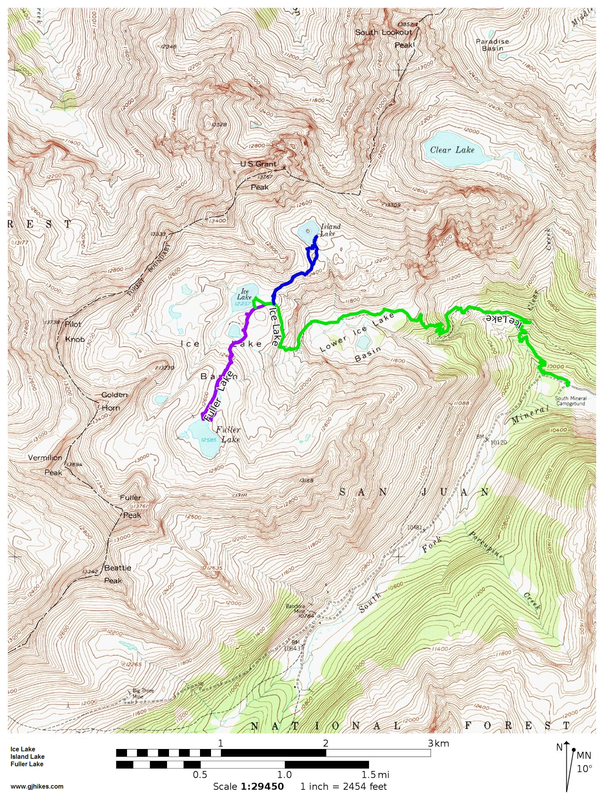 To continue on to Fuller Lake either stay on the main route as it travels above Ice Lake or go on over to Ice Lake and then rejoin the main route afterwards. Striking views of Fuller Peak and the high ridges of Vermillion Peak form a beautiful scenic backdrop to the trail. The trail works its way around a small bowl where an unnamed lake sits slightly below and next to Ice Lake. After passing by the smaller lake the trail begins climbing in earnest up to the basin that holds Fuller Lake. Once up to the basin the trail levels off and travels beside the stream that drains Fuller Lake. An abandoned home site sits next to the lake where there is a picnic table that to sit at and take in the scenery. We are guessing that the people that lived here are the same ones that worked the Diamond Mine and perhaps the Grandview Mine and who gave their name to the lake and Fuller Peak. From left to right the peaks are Fuller Peak (13,761), Vermillion Peak (13,894) and the Golden Horn (13,769). Vermilion Peak undoubtedly gets its name from the purplish red colored rocks along the south shore of the lake and the Golden Horn from its yellowish gold colored rocks. The views of Ice Lake on the hike down from Fuller Lake are exceptional. Ulysses S. Grant Peak is the mountain in the distant center of the photo. Island Lake is located at its base. Fuller Lake is worth the little bit of extra effort that it takes to get to after hiking to Ice Lake. The views of Ice Lake from the trail to Fuller Lake are probably better than the view from the shores of Ice Lake itself. Most of the day hikers that we watched were going all the way to Fuller Lake but then leaving without hiking to Island Lake. Fuller Lake is probably a little easier to get to than Island Lake but both lakes are different enough that hiking to both is recommended. If you would like to see it for yourself then all you have to do is 'Take a hike'.